Building a network is a long process, and if you want to play by the LinkedIn rule, you add onto your network only people you should know. I’ll write something on how to build a network soon. But, and here the trick, LinkedIn allows us to have a public profile. That means that your profile (or part of it, you can decide) will appear on Google, Yahoo!, Bing and so on. So, even if you don’t have a linkedIn account, you can find people thanks to Google. Thanks to Katharine Robinson, you can actually search as well with /pub/ instead of /in/. We can notice as well that LinkedIn use the country code as a “pre-fix” on their address. So you can refine with java developer site:uk.linkedin.com/in/ that will return only UK profile! Do you think you are using Google at 100% capability? Think again! Google, everyone is talking about it. Everyone is using it (well, almost). 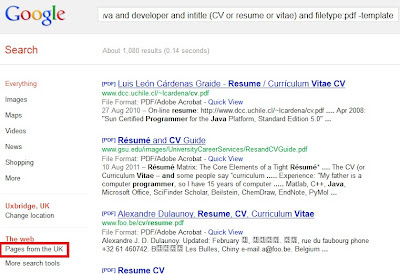 So it is not really a surprise that for my first post, I’m going to give you tips on how to use it in order to find candidates CV. All links in this post will open a search result, nothing else. 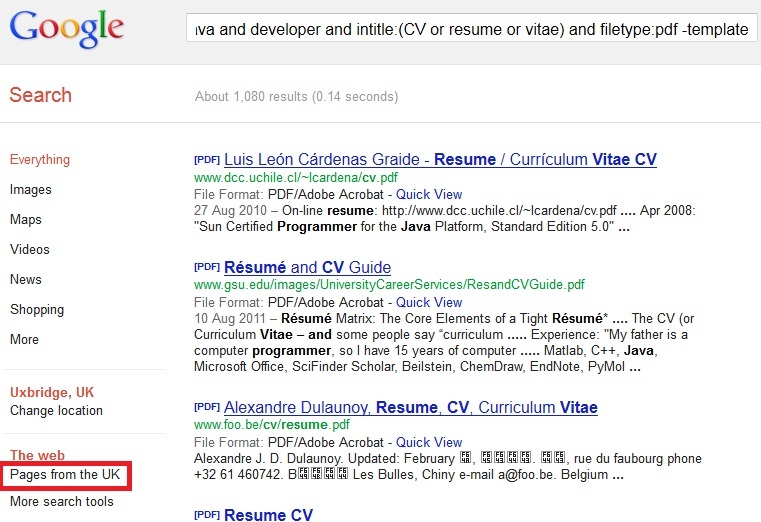 So how Google could help you find candidates? Let take an example. Imagine, you are trying to look for a Java developer. Your database is not helping you much. You already posted adverts on all the job boards you know. Ok, you don’t know where to search. Well, if you are trying Java developer on Google, you have 35 000 000+ results. Yes, you can indeed adding few key words in the query line but today’s tips is more about specific operators you can play with. How can this be useful? It will order Google to look for key words only on the title of the web page. So, try the same search but this time with intitle: operator. “Only” 200 000 results. Still way too many. I obviously assumed that you already know the “And” operator. The only drawback is that we have no 2+ million search results. Most of recruiters will always look after PDF or Word document. Yes, they want your CV, in .doc format please, so they can remove your contact details and send it to their clients (you approval is, depending of the agency, relevant or not). So, let try to find a way with the filetype: operator. A file will always (in Windows based operating systems) have a name (i.e:myfile) and an extension (.doc). The extension will tell your operation system to open myfile.doc with a specific software (in this case, Word or OpenOffice Writer). 1 000+ results but at least they all are in pdf. 102 search results of Java developer in the UK. Labels: Google, operator, search, tips. Firstly, I’d like to thank you for passing by! In order to introduce me quickly, I’ve been working for the recruitment industry for the past 6 years now. I’m currently the internal trainer of one in many recruitment agencies. No need to name it, this is not the point of this blog. Sourcing candidates is a big challenge. Finding the right people before the competition is the aim of every recruitment consultant. I came across a lot of tips during those 6 years. This blog will hopefully give you some technique which are not really used, but, in certain cases, might give you an edge. There will be no secrets techniques, everything that will be posted here will be follow by sources. I just have been curious to find them. My apologies in advance, English is not my mother tongue, so I do make some mistakes. If you come across some, please let me know!